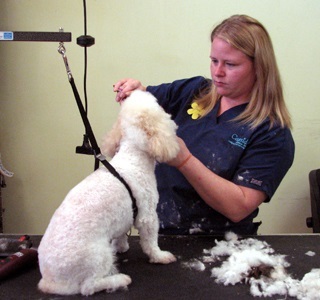 The Capeside Animal Hospital groomer, Tasha Green, has been with Capeside since April 2009. Tasha has worked with both of Capeside's previous groomers and is excited to have taken over as our full time groomer. Tasha is a talented groomer and she will treat your pet with compassion and patience. If needed we provide sedation for pets that require it for grooming. She schedules appointments for dogs and cats Monday through Friday, with convenient morning drop off appointments. Your pet is usually ready within 5 hours. Please contact Tasha for rates and availability at 383-2100!